Fonio is being touted as the next quinoa in the specialty grains market. Fonio (Digitaria exilis) is an ancient grain that grows in small pockets throughout West Africa. It starts out looking like a field of green grass, and at its maturity looks like hay. It is then harvested with traditionally made hand tools, hand processed to remove the seed from the husk and washed and dried thoroughly. The grain itself is the smallest in the millet family, with nearly 2000 grains per gram! It is used traditionally as a staple side dish for breakfast, lunch, and dinner in a variety of preparations. 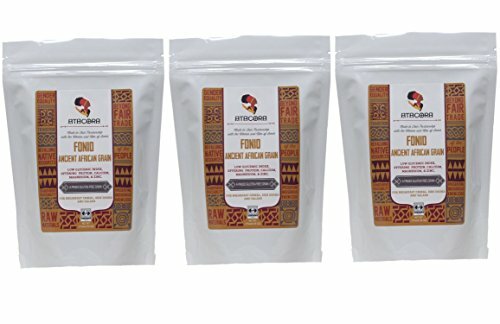 Fonio is the most ancient of grains, and plays a large role in the mythology and tradition of numerous African ethnic groups. The Dogon people of Mali believe that the Universe was created from a single grain of fonio. Fonio has never been a "big name" item in the states until it was recently re-discovered by Foodies and Health Care Practitioners. Fonio does not contain any glutamine or gladding proteins which are the constituents of gluten, making this cereal suitable for people with gluten intolerance. Cook Fonio as you would rice. Fonio is versatile, healthy and delicious. Experiment to find your favorite cooking method and texture! Fonio is a rare, gluten free ancient grain from the millet family prized for its flavor, easy digestibility, and tolerance by diabetics. Rich in protein and essential amino acids, especially methionine and cystine. Low glycemic index. Excellent as a side dish, in salads, and as a delicious breakfast cereal. Add it to breads and casseroles. Use it wherever you would millet. It is similar to couscous in the way that it takes on the flavor of whatever it's cooked with. Reseable BPA-free bag keeps it fresher longer. Atacora joins with the women and men of Benin through Fair Partnership. If you have any questions about this product by Atacora, contact us by completing and submitting the form below. If you are looking for a specif part number, please include it with your message.